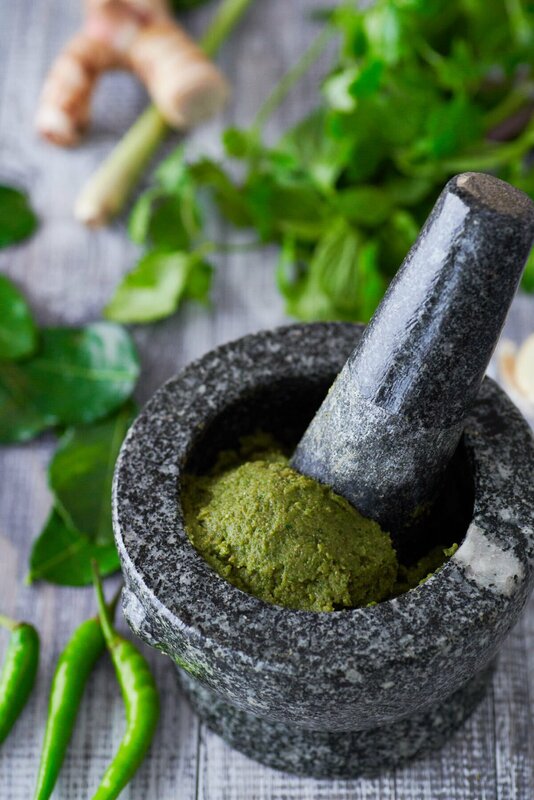 This fragrant green curry paste is loaded with green chilies, spices, aromatics, and herbs which makes it the perfect foundation for making a mouthwatering Thai Green Curry. It’s also a versatile condiment that can be used to season fried rice, noodle soups, and stir-fries. Because it’s plant-based, you have the flexibility to add tofu and eggplant for a vegan green curry, or meat such as chicken for a more traditional green curry. I’ve been craving a good Green Curry since getting back from Thailand, so I decided to quench the craving by heading to a Thai grocery store and picking up the supplies to make my own! Green curry paste (พริกแกงเขียวหวาน – prik gaeng khiaowan), is a concentrated paste made of spices, herbs, aromatics and green chili peppers that’s used as a base for making a variety of Thai dishes. 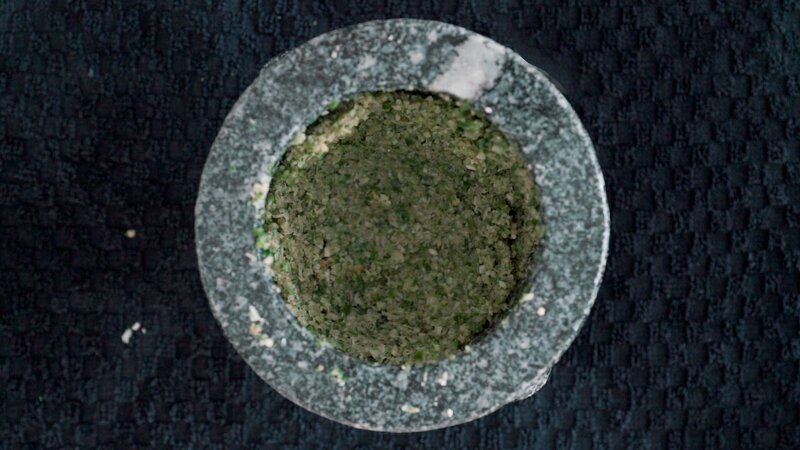 It’s traditionally made by grinding the ingredients together with a mortar and pestle into a smooth paste that can then be fried. 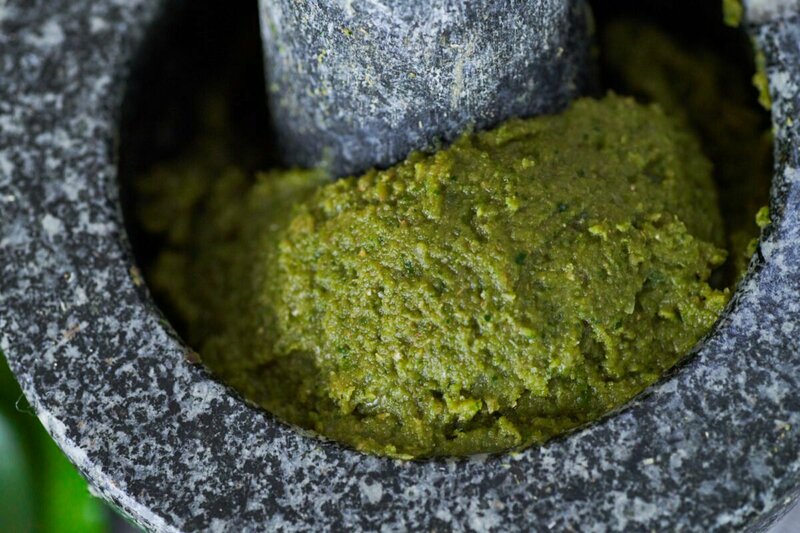 These days it’s possible to get pre-made Green Curry Paste in almost any supermarket, but the flavor just isn’t the same as a fresh curry paste, and I highly recommend making it from scratch. The most obvious reason is that green curry paste uses green chilies whereas red curry paste uses red chilies. But beyond the difference in the color of the chili peppers, there subtle variations in the types and amounts of spices and herbs added, giving this curry a fresh herbal flavor. I’ve used green bird chilies for this curry paste, but because they can be very spicy, I don’t add a lot. If you use a less spicy chili such as Jalapenos or Serranos, you can add more, which will give your curry paste a darker green color. The basic spices in red, green and yellow curry are coriander, cumin, white pepper, and galangal. The difference is in the proportions of each added to the curry paste. For my green curry, I like using a higher ratio of coriander relative to the other spices. The usual herbs are lemongrass, cilantro root, and kaffir lime zest. Since the limes can be difficult to find outside out of Thailand, I usually substitute the leaves. The only trouble with using the leaves is that they are very fibrous, so it’s important to mince them as finely as possible before adding them to the mortar. I also add some Thai basil to my green curry paste. While it does help make the curry paste greener in the short term, basil oxidizes rather quickly, which will discolor your curry paste. That’s why I only add a bit for flavor. Finally, for the aromatics, the traditional ingredients are shallots and garlic. If you can find the small marble-sized shallots used frequently in Southeast Asian cuisines that would be ideal, but if not, larger Western shallots or even red onions will work. 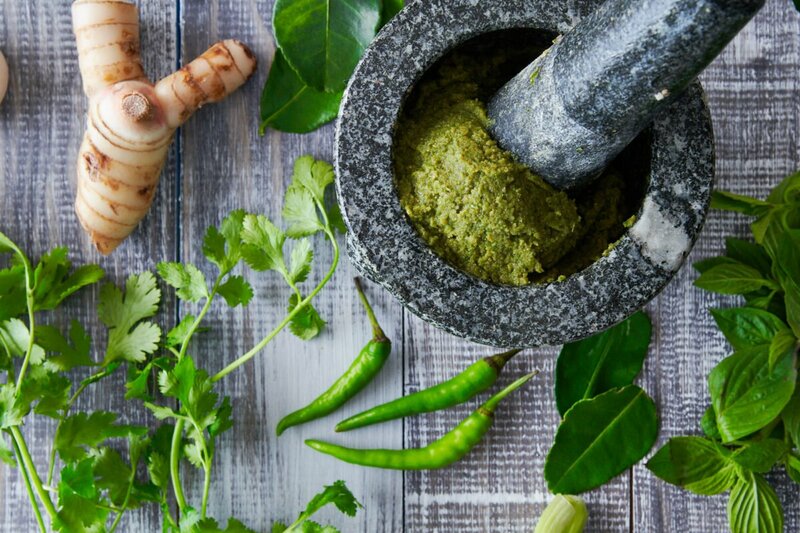 The most obvious use for Green Curry Paste is to make a classic Green Curry Chicken, but this can also be used as a versatile condiment. For example, I like making green curry fried rice by frying some paste in a generous amount of oil and then adding rice, egg, and bamboo shoots. Then I season it with a little fish sauce and finish it off with Thai Basil. The paste also makes for a delicious green curry noodle soup by frying the paste in oil until fragrant, adding chicken, chicken stock, coconut milk, and vegetables. Once the chicken is cooked through, you can add some rehydrated rice noodles to make for a soul-warming soup. Another way I like to use it is to season ground meat to make sausages, meat pies, or a Thai-style soboro that works great in a bento box. Put the coriander seeds, cumin seeds, and white peppercorns in a frying pan and toast, over high heat until they are very fragrant. 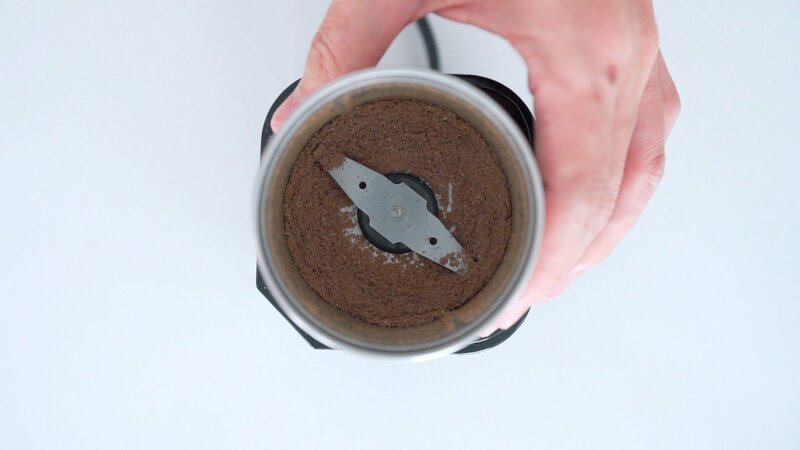 Remove the pan from the heat and transfer the spices to a mortar, or spice grinder and grind them into a powder. 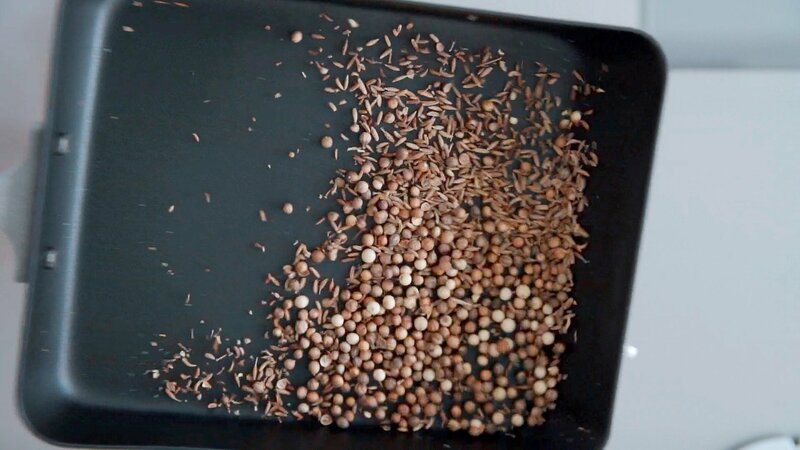 If you ground the spices with the mortar and pestle, transfer them once to a separate bowl. Add the lemongrass, galangal, kaffir lime, cilantro roots, green chilies, and salt to a mortar and pound this until it starts to form a paste. If you are making a very large batch, you can use a small food processor, but this isn't enough green curry paste to make the food processor spin effectively. 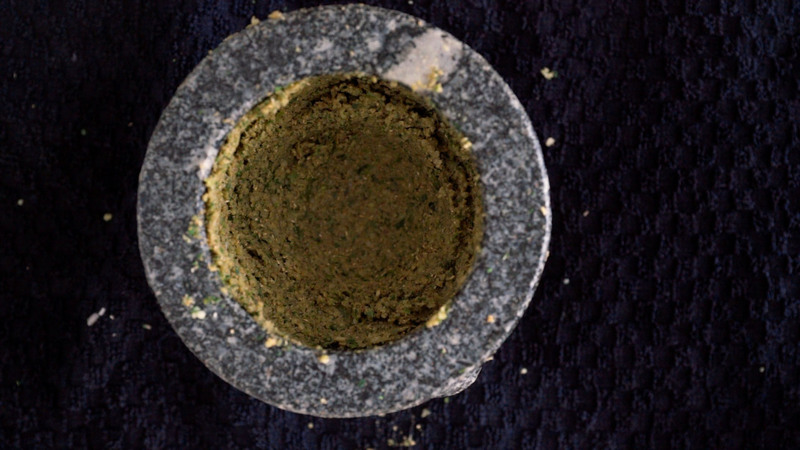 Return the ground spices to the mortar and continue pounding until the mixture forms a fine paste. Add the shallots, garlic, and Thai basil and continue pounding the mixture into a smooth paste. 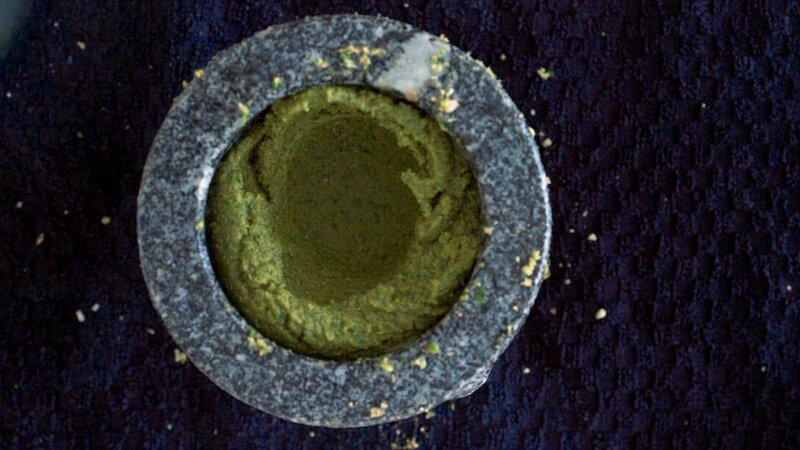 Use the green curry paste right away, or, if you're making a big batch, you can portion and freeze it for future use.